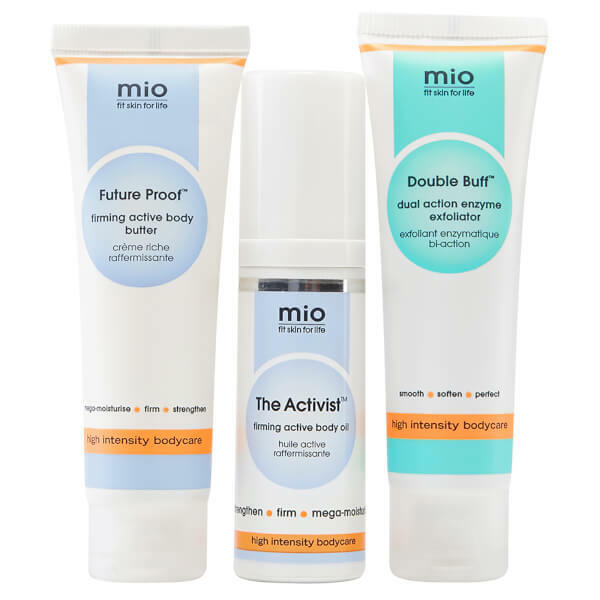 Strengthen your skin with Mio Skincare's 'Strong is the New Skinny' Kit, a range of travel sized skincare products dedicated to transforming your skin's appearance. Expect glowing, radiant, smooth looking skin with enhanced strength and protection. - K.N. A daily nourishing oil like no other. Expertly locking in moisture, the multi-purpose body oil works to balance the look of scars, stretch marks and uneven skin tone. Its intensely hydrating, antioxidant rich formula delivers moisture and nutrients deep down. As skin ages, natural oil production decreases, which can result in loss of bounce and radiance. Counteract this by feeding your skin essential nutrients and vitamins. Skin feels ultimately moisturized and protected. - K.N. An exfoliating scrub that works to slough away unruly dead skin cells; rough skin becomes smooth, supple and radiant. Helping to reveal brighter skin, the scrub blends non-abrasive pumice, lava and Bamboo to gently polish and buff. Skin tone appears to be evened out and your complexion looks healthy, renewed and glowing. A heavy-duty body butter that works to replenish and hydrate super dry skin, deep down. Packed full of moisturizing properties, including organic shea butter and hyaluronic acid, the rich butter helps replenish the moisture in ultra-dry patches whilst its nutrient-rich ingredients help skin feel thicker, more resilient and mega-moisturised. Delivering intense hydration, the body butter effectively counteracts dryness and can boost elasticity, enhancing the appearance of skin bounce whilst delivering superfood nutrients for glowing, future-proof skin. - K.N. Future Proof: Aloe Barbadensis Leaf Juice, Cyclopentasiloxane, Aqua, Glycerin, Caprylic/Capric Triglyceride, Prunus Amygdalus Dulcis Oil, Butyrospermum Parkii Butter, Cetyl Alcohol, Glyceryl Stearate Citrate, Cetearyl Alcohol, Caprylhydroxamic Acid, Glyceryl Caprylate, Sodium Stearoyl Glutamate, Olea Europaea Fruit Oil, Punica Granatum Seed Oil, Argania Spinosa Kernel Oil, Sodium Acrylate/Sodium Acryloyldimethyl Taurate Copolymer, Isohexadecane, Polysorbate 80, Moringa Oleifera Seed Oil, Vaccinium Corymbosum Seed Oil, Cocos Nucifera Oil, Hyaluronic Acid, Parfum, Limonene, Linalool, Citral, Citronellol, Evernia Furfuracea Extract, Beta Glucan, Tocopherol, Ganoderma Lucidum Extract. Oil: 30ml / Exfoliator/Butter: 50ml.